← Handmade Umbilical Cord Ties. 280g of good-quality dark chocolate, 70% cocoa solidsÂ of good quality dark chocolate per placenta. Chop 230g of the dark chocolate and tip into a large glass bowl. Place over a pan of water and melt. Then mix in about 1/4 pint or more of coconut milk to make the ganache. Stir the chocolate and coconut milk together until you have a smooth mixture. I then mix in the dry powdered placenta and add something to hide the texture like ground nuts, coconut flakes or whatever takes your fancy. You can add any flavour to the truffle mix at this stage to taste. The zest and juice of an orange works well. Cool and chill for at least 4 hrs. To shape the truffles, dip a melon baller in hot water and scoop up balls of the mixture, then drop the truffles onto greaseproof paper. or lightly coat your hands in flavourless oil (such as sunflower) and roll the truffles between your palms. Coat your truffles immediately after shaping. 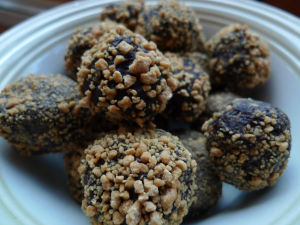 Tip toppings into a bowl and gently roll the truffles until evenly coated, then chill on greaseproof paper. Try: crushed, shelled pistachio nuts; lightly toasted desiccated coconut; or roll a truffle flavoured with orange zest and juice in cocoa powder. To coat in chocolate, line a baking tray with greaseproof paper. Melt the rest of the dark chocolate or you could melt milk or white chocolate. Allow chocolate to cool slightly. With a fork, pick up one truffle at a time and hold over the bowl of melted chocolate. Spoon the chocolate over the truffle until well-coated. Place on the baking tray, then chill. Feel free to ask any questions and enjoy!